1 What is Helium 10? Helium 10 is a mind blowing all in one Amazon toolbox featuring a set of 16 priceless tools specially focused on keyword research, product research and competition tracking. Helium’s has been developed by Amazon Sellers, that’s why it is one of the best tools in it’s category. The project is leaded by Manny Coats, serial entrepreneur, and online marketing coach since the late 1990s. He also hosts host AM/PM Podcast and co-founded Freedom Ticket, an exclusive mastermind group for high-level Amazon sellers. Besides that, they keep adding new features every year without an extra cost! But it won’t work for Amazon Retail (Vendor selling). Long story short: this feature will help you get more reviews, which will lead you to more sales velocity and better organic rankings on Amazon. Another 2019 tool to keep your listings safe. Products listings are monitored 24/7 for fraud & other unintended changes and you’ll be notified in real time if they do. Years ago it was known as “Brand Gate Checker” and it was intended to protect brands against listing hijacking and counterfeits. A powerful research tool to find the most profitable products based on your criteria (not just keywords, categories or ASINs). 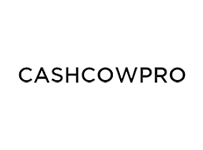 Find your next private lable product winner in just a few clicks. 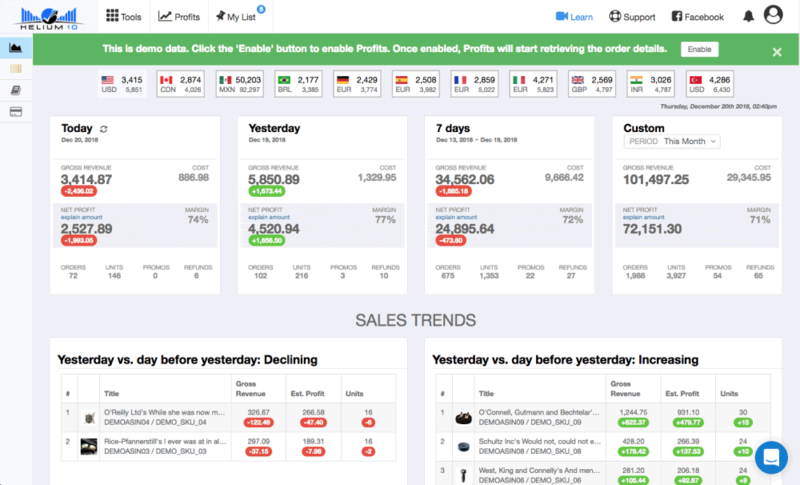 A powerful data analytics tool that will give you information on a product seasonality and trends to decide wether it’s a product with steady demand or not. Magnet is Helium 10’s keyword research tool. I’d say: “the definitive keyword tool” as I can assure you won’t need another one. Not only will let you find profitable keywords and search phrases used by users, but analyse wether those keys are on your rankings or not. 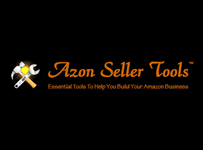 A keyword tool processor to help you obtain monthly search data and profitable lists. Frankestein can quickly process thousands of keywords in bulk and show you the search volume data, competition, popularity… Then you will convert this keywords into texts for your listings or back-end keywords. No more boring copy and paste. Scribbles automatic adds the keywords to your seller central via Amazon Seller API. But not just that, Scribbles will also help you check if you are using the most profitable keywords on your product name, description and bullet points. The tool will make your listing optimization easier, being able to write you product name, description and bullets on the tool and check if they are lenght and keyword relevance compilant. A keyword indexation tool for you front and back-end keywords. Also identifies bad keywords to prevent them to be indexed instead of the golden keywords, so you can clean the rubbish on your listings. A reinbursement tool which finds lost or damaged inventory to send emails to the FBA guys and get your reinbursement money back easily. Well, I must say this is my favourite one. Spy on your competition by getting loots of keyword ideas using reverse ASIN. Cerebro will give you data on search volume, number of competitors and competing products, information about the keywords using on PPC campaigns and their Cerebro IQ Score. Prevents inventory hijacking setting quantity limits to every product in your catalogue so no one is buying a huge quantity of your products and breaking your stocks. Marketplace sellers and Private label sellers often launch promotions and coupon codes (using services like Jumpsend) and they’re often blackhated by their competitors placing high quantity orders with the goal of wiping out their inventory. 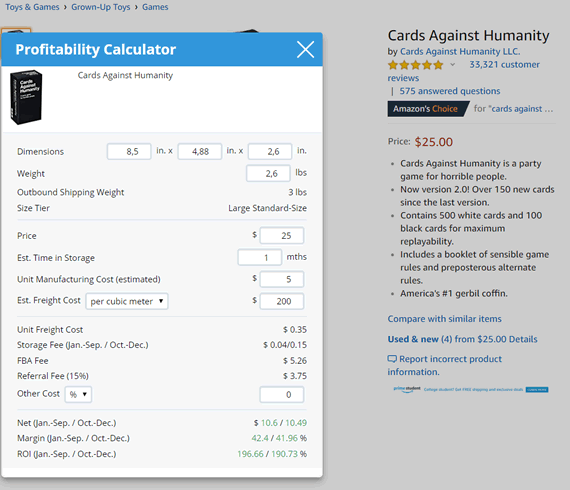 You can set limits on quantities purchased on certain items on Amazon, so you can prevent inventory black hat tactics. With the inventory protector tool you can set those limits easily. Of course, you can set those limits also on Seller Central, but it is a tedious task that can be made faster using Helium 10. You don’t need to be Sherlock Holmes, this is a tracker for your Amazon keywords. 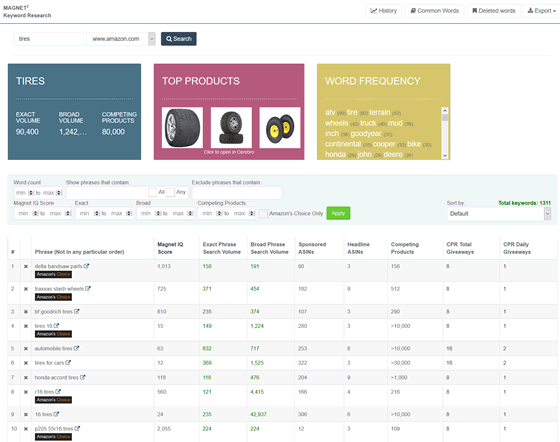 Basically introduce the keywords you want to track per ASIN and the tool will start monitoring them. A real time alert to check if your Buy Box has been hijacked by your competitors so you can take action quickly. A misspelling search tool to maximize your keywords. The Misspellinator will show you misspellings for your main keywords, so you can include them on your front and back-end keywords and get some precious (and low competition) traffic for those keys. Shows information on how a product in performing accross multiple Amazon markets. Starting at 0$ (free plan) and then 37$ a month until 197$ and tailored pricing, Helium 10 is one of the cheapest all-in-one Amazon tools on the market. You know, folks at Helium are really nice people, so they just gave us away to use and grab an interesting discount on their tools. Feel free to use one of them, this discounts will never expire! This is the most powerful all in one tool I’ve tested so far. Sellics is a great tool, but nothing compared to Helium 10, specially when it comes to keyword researching and keyword index checking. Also, Cerebro’s competitor spy has nothing to do with Sellics competition analysis. It gives you more and more useful data. 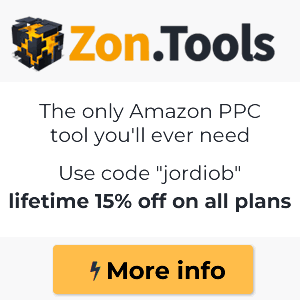 For pennies (37$ a month per feature or 97$ for all of them) you can have a great tool on your hands that will save you tons of time and, specially, lots of dollars compared to other so called all in one tools. Try SellerApp once. All in one tools. Easy to use.